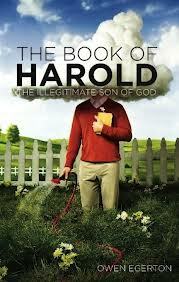 “The Book of Harold” by Owen Egerton is out in paperback from Soft Skull Press. You can read the first chapter here. One of the oldest ways to create suspense in a story is to create a repeating sequence of events. So, in “The Three Little Pigs,” we watch the wolf blow down two houses before going to the third—where his plan goes awry. In a more contemporary example, the film Oceans Eleven, plus every heist movie ever made, first shows the thieves planning the heist and then practicing the heist, and when they finally put their plan into action, something goes wrong. Both of those stories—the fairy tale and the blockbuster film—spend time establishing how events should go so that they can go wrong. Next, we’re shown the casting and introduced to the doll that will play Baby Jesus. Then, we’re shown the children practicing the pageant, running through the entire show. Next, we’re given a quick description of the first two nights of the pageant. Finally, the last performance is upon us. We know the drill by heart, and so do the characters. Notice how they begin to alter the routine: the donkey drop “balls of dung every other step,” a Wise Man slips on the dung, and chaos ensues. Notice how each telling involves a bit of irregularity: the introduction of the drummer boy, the casting of the narrator as Joseph, the drummer boy mis-delivering his line, angels crying, and finally donkeys pooping. Yet, even though the reader expects an unexpected turn of events, there is no way to foresee what actually happens. The thrill, for the reader, is in waiting for the predicted, yet unpredictable, twist. In addition to repeating the pageant, the passage contains words that clearly cue the reader into where things will go wrong. For instance, Egerton writes, “We practiced for two weeks. My part was simple enough.” The word simple is similar to Chekhov’s proverbial “gun on the wall.” If you show a gun in the first act, it must go off by the third. If you use the word simple in the beginning of a story, the story had better complicate that simplicity. Choose a scene that will repeat itself. The scene could be one that involves planning and practice (a wedding, shouting “Surprise!” at a birthday party). Or it could center around someone involved in a routine activity (door-to-door salesman). People the scene with characters. For instance, a wedding or party will have guests. A door-to-door salesman will visit homeowners. Tell the reader how the scene will play out. Be detailed. First, X will happen. Then X. Then X. Finally, X. The more detailed steps you provide, the more opportunities you have to make things go wrong. Show the scene once or twice. In each of the tellings, something should go slightly wrong but not so wrong that the characters can’t deal with it. Finally, show the scene a final time, adding big, unexpected challenges. Ideally, you’ll let the challenges build on one another. So, something goes wrong in the first step of the sequence, and that problem creates a slightly larger problem in the next step, and so on, until the final step, when the sequence has devolved into chaos. It helps if you give the main character a sense that something might go wrong—or if you generally introduce the idea that all might not go according to plan. You can introduce the idea subtly or in an obvious way. The point is to show the sequence of events while hinting at a twist in the sequence. Be inventive with this exercise. Remember, you want to surprise an expectant reader.